Win The King Sweepstakes 2017 - Enter Now At WinTheKing.com! 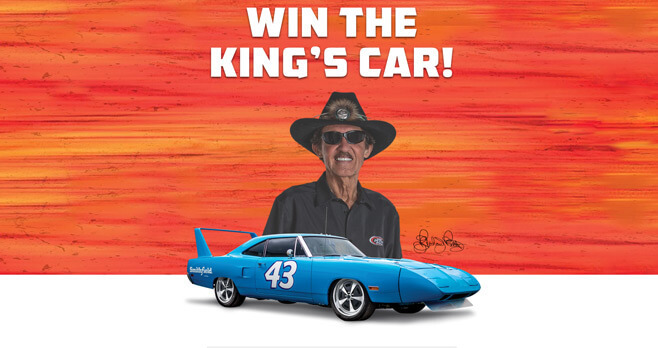 Starting on August 20th, enter the Win The King Sweepstakes online at www.wintheking.com or by texting your receipt showing the purchase of any 3 or more Smithfield, Eckrich or Nathan’s Famous brand products for a chance to win Smithfield’s Tribute to Petty’s iconic Superbird built by Petty’s Garage and inspired by Richard “The King” Petty’s 1970 Plymouth. The Smithfield Superbird Giveaway can be entered at Safeway, Albertsons, Vons, Shaws, Jewel Osco, ACME Markets, Randalls, Pavilions, Carrs, Tom Thumb, Star Markets, United Supermarkets, Market Street, Amigos, Lucky and Super Saver. To enter Smithfield’s Win The King Sweepstakes 2017 without making a purchase, visit www.WinTheKing.com during the Sweepstakes Period and submit your name, state, zip code and email address under the applicable Division banner. Additionally, you may also participate by sending a text message containing the applicable keyword to 82257 along with a photo of your receipt showing the purchase of any 3 or more Smithfield, Eckrich or Nathan’s Famous brand products in a single transaction during the Sweepstakes Period. Please find a list of all applicable keywords below. The Smithfield Win the King Sweepstakes 2017 is open to eligible legal U.S residents who are 18 years of age or older at time of entry. Void where prohibited by law. The Sweepstakes Period begins at 12:00:00 a.m. on August 20, 2017 ET and ends at 11:59:59 p.m. ET on October 3, 2017. Limit one entry per receipt uploaded regardless of the number of eligible products purchased on the receipt. Maximum of 5 entries per person for all divisions during the Sweepstakes Period, regardless of method of entry or whether an entrant is eligible in more than one division. One Grand Prize Winner will win the 1970 Plymouth Road Runner Smithfield Superbird Tribute Car. In lieu of the car, the Grand Prize Winner will have the option of receiving $39,000 in cash. Approximate Retail Value of Grand Prize is $39,000. Total ARV of all prizes is $87,872. Winners will be selected randomly from among all eligible entries received during the Sweepstakes Period. Sponsor will conduct a random drawing on or about October 6, 2017. Potential prizewinners of the Drawing will be notified by telephone or email on or about October 6, 2017. For the names of the winners, send a self-addressed, stamped envelope to: Win the King Sweepstakes, 3722 Illinois Ave., St. Charles, IL 60174 by November 30, 2017. Sponsored by Smithfield Farmland Sales Corp., 111 Commerce Street, Smithfield, VA 23430. For complete details, including Official Rules, visit www.wintheking.com. LOVE THIS CAR. A CHANCE TO MEET THE KING WOULD BE WORTH THE TRIP. best race car ever made! had a 1974 Plymouth roadrunner and I love to drive it all over. Why can’t you register to win in South Carolina? Are you kidding me!!! We live in Missouri and we can buy your products but can’t enter this sweepstakes. This is wrong on so many levels! It’s bull. So guess I went buy your products anymore!!! This is not fair. I live in Wisconsin and there is not a store where I live, so I can’t enter this contest. NOT FAIR! Would really like to enter.